Located not far away from the hustle and bustle of Northbridge along Lake Street is Tarts Cafe. After work on a Saturday, mum and I decided to treat ourselves to brunch at Tarts. Tarts is a cute little cafe with a homely and welcoming atmosphere, making it a comfortable place to dine. Take a peek at their little fridge and you can see plenty of sweet treats, all made fresh in store. Yes, it can be a bit hard to decide what to get sometimes too. 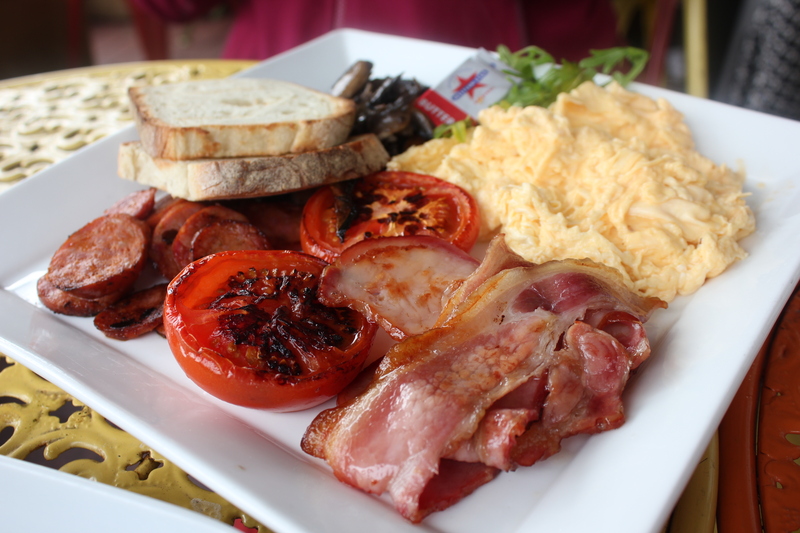 Mum had the Grande breakfast ($24.90) which comprises of scrambled eggs with bacon, chorizo, grilled tomato and mushrooms served with ciabatta bread. If you want a hearty breakfast to make a grand entrance to your day, the Grande breakfast is for you. I had a taste of each element and they are so delicious, from the fluffy scrambled eggs to the perfectly cooked chorizo. 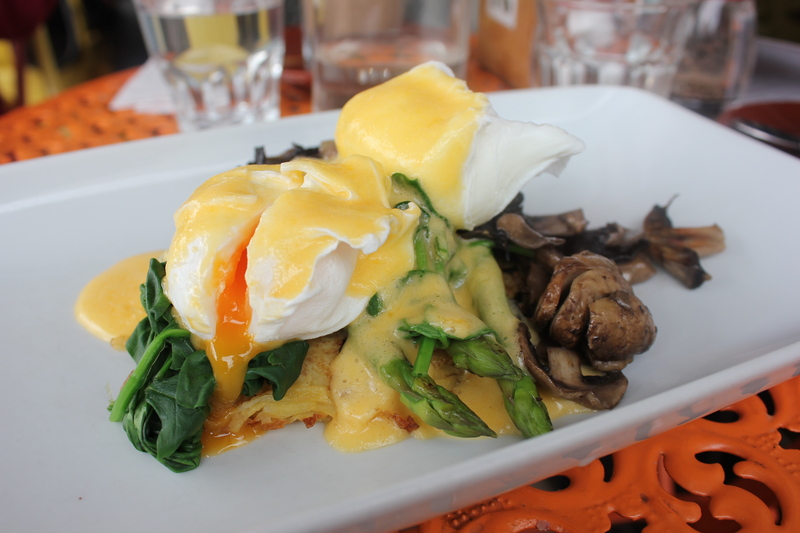 For me, I had the potato head ($19.90) which consists of two poached eggs, asparagus, mushroom, spinach and hollandaise sauce on a potato cake. The eggs were poached perfectly with liquid golden egg yolk oozing out, drizzling down to the plate. I love the potato cake at the bottom. Slightly crisp on the outside and soft in the inside complementing well with the creamy textures of the hollandaise sauce and earthy flavours of the mushrooms. One must not leave Tarts without trying out what they are popular for – their homemade tarts! We shared a Raspberry Tart ($6.80). The pastry was perfect, it was crisp and crumbly, complementing well with the sweetness from the raspberries. 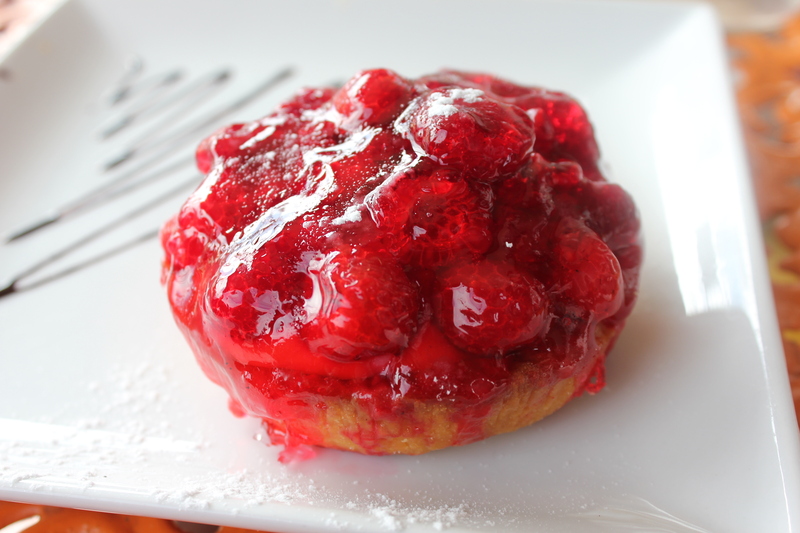 And just look at those beautiful shiny, glazed raspberries on top, like icing on the cake. Overall, we had a great dining experience at Tarts. The service was very friendly and attentive. Tarts Cafe makes a perfect place to catch up over brunch or indulge in their delectable pastries or tarts for afternoon tea. Not only Tarts is open for brunch and lunch, but they do dinners as well with special degustation nights and jazz singers. If you have the 2015/2016 Entertainment book, you can use the voucher for Tarts here too!